With a retro and polish finish, both are surprisingly affordable at $69 each (Php3312). 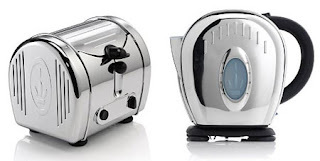 The toaster has room for two rounds of bread and offers a rolling dust lid, temperature sensor and browning regulator. The kettle has a hidden heating element (so no limescale) and 360 degree rotation on the base.